Somebody blinked during the photo! LEGO Batman: The Videogame was released for the Wii in the U.S. on September 23, 2008. 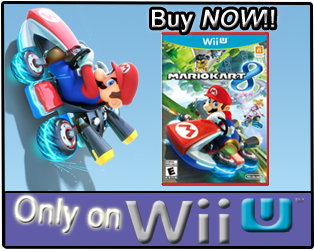 The was a multi-console release, and the Wii version released with a MSRP of $49.99. The game was developed by Traveller's Tales and published by Warner Bros. Interactive Entertainment in conjunction with DC Comics. It received an ESRB rating of "Everyone 10+" with "Mild Cartoon Violence" listed as content for gamers and parents to be aware of. How many hours have U.S. Wii owners spent running around Gotham City in LEGO Batman: The Videogame, trying to put the pieces back together? How does the average play-time per session played compare to The Dark Knight Rises' runtime? Brew yourself some dark coffee, and let's take a look! Data shown is for U.S. Wii players only, not world-wide. 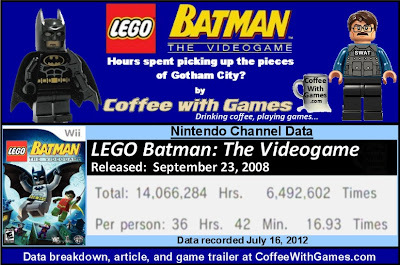 LEGO Batman: The Videogame has approximately 383,496 U.S. Wii owners that have reported game-play hours from Gotham City, with 1,392 days possibly reported. The game has an average play-time per day/session of just over 2 hours 10 minutes. How does that compare to the movie if you are planning to go see it? Well, The Dark Knight Rises has a runtime of 2 hours 45 minutes, which means if you have been a fan of LEGO Batman and averaged about the same play-time, the movie will be more than half-an-hour longer than your average time with the game. So, buy some popcorn before entering! What about the reviews for the game? 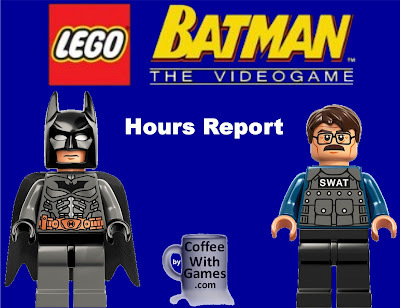 LEGO Batman: The Videogame's Wii version has a "professional" critic review score average of 73.58% based on 19 reviews on GameRankings.com, while the game has a customer review score average of 85.50% based on 138 customer reviews on Amazon.com. Customers, once again, have rated the game higher than the critics. Seeing another LEGO video game with a high hour average "Per person" should be encouraging to customers, perhaps looking at buying game. It means you can get a new copy of the game for under $20 now, and expect to get a solid number of hours and apparently some good replay value from it. With the number of hours reported and averaged for the game, I would say LEGO Gotham City is probably one of the cleanest and well kept cities around now; but bad guys are always looking to make a mess, so keeping the pieces in place is a continuous job I guess. I think this is definitely a situation where the video game provides you more for your money than the new The Dark Knight Rises movie, just based on cost-per-hour of entertainment. Have any of you played any version of LEGO Batman: The Videogame, and if so, what did you think about the game? 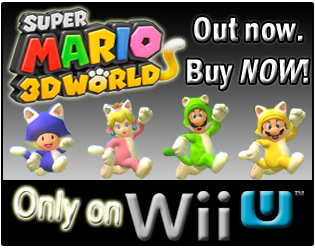 Is it a LEGO game you would recommend to other Wii, PS3, or even Xbox 360 owners looking for a new game for under $20? Also, do any of you plan on seeing The Dark Knight Rising this weekend? We have this for the 360. My youngest has played it the most. I like the LEGO games, but they usually serve as short-term diversions for me. The one thing that stood out to me in this one is there was more vertical scale than in prior LEGO games, at least that was my impression. It was fun, but it lacked some of the whimsey of other LEGO titles. I want to see Dark Knight Rising this weekend, but will probably wait until next weekend just to avoid overly packed theaters. I have Lego Batman for the DS and it is pretty fun. That average hour playtime stat of 36 hours is REALLY impressive! "The one thing that stood out to me in this one is there was more vertical scale than in prior LEGO games, at least that was my impression." Interesting about the "vertical scale" part, we don't own this one, but we do have two LEGO games in our collection that need to be opened AND played. One of them joined the collection in the last 2 weeks, but I haven't mentioned (or blogged about) it yet. "I want to see Dark Knight Rising this weekend, but will probably wait until next weekend just to avoid overly packed theaters." We were actually traveling across the country for the last 2-ish days, so we weren't planning on seeing it this weekend anyway. We arrived at our destination, and on the front page of the paper a girl from LA was actually injured in the shooting, because her and a friend were driving across country back to LA and that was the town they were driving through when they decided to stop and watch the movie...that whole situation is just insane. I debated on getting the DS LEGO Star Wars game, but never picked it up. "That average hour playtime stat of 36 hours is REALLY something!" It is, especially when comparing it to a few first party Nintendo games that have the words "Mario" and "Super" in their titles. Pretty incredible I thought. Thanks for the comment and the "FYI"! And glad I could help. LEGO Batman, the video game would be pretty cool to play, the price of it is not so expensive. So I would like to buy it as soon as possible. Instant "Coffee" Video Game Award! June Brewed - Coffees Consumed, Games Played!